For last year I've been developing a match 3 game with (i think) interesting mechanics. 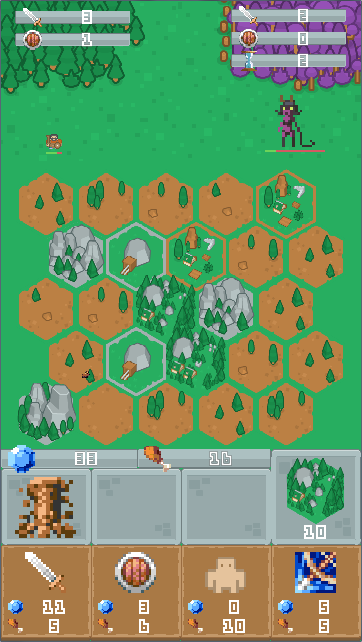 In this game - Hexival, You have to build your kingdom using limited amount od hexes while defending your land from incoming monsters. - ‎village - triggers unit attack. Using gathereded resources You can buy attack or armor upgrade, new soldier or trigger soldier attack. After placing each Hex monster delay counter will decrement and when it reaches zero, monster will attack your units (counter value will go back to start value). When You defeat monster a new one will appear and You will be rewarded with some amount od new hexes, diamonds and food. What do you think about this mechanics? Would you change something? Is it interesting? Btw, I'm using libgdx with guava. If you provide a playable version I can say more about the game. Is there a mechanism to grow your kingdom by managing it, or just by gathering items after killing monsters? @meva: currently there is no managing mechanism, you develop your kingdom by placing and maching specific hexes and by using items. Do I see here an influence of The Witcher;)? For me the concept of the game is ok. You can improve mechanics later by adding more features. I've made little promo gif for game, using new artstyle. What do you think? Hi there, I've managed to make alpha release to Hexival. I want to know any (good or bad) opinion about this game. - no additional game modes except endless mode. - I want to add items which could be used on map and on battlefield, for instance item which could kill monster and would destroy one hex from map etc., etc. Place hexes on map in order to receive resources and expand your kingdom. Defend it from monsters with your soldiers attack triggered by grouping hexes. Monsters can steal your resources or hexes, attack your soldiers and add obstacles to your kingom. Spend money on unit upgrades, additional soldiers or additional hexes. Game will be over if all your units die or if you spend all your hexes. Tell me if you liked it or not. Is this design good idea or not? Did you want to change anything (or everything) in the game? If yes, then what would you change?